What can I say? 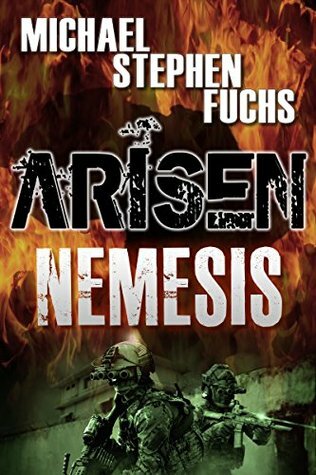 This is the best zombie/military series out there.Nemesis is a separate story from the Arisen series, yet it provides a lot of information we readers need to finish off the series. Tons of unbelievable way over the top action that we have come to love. This is only the 2nd companion Arisen book written solely by Fuchs. The other being (which is one of my all time favorites....I need to add it to my Profile shelf). Well, Genesis and Nemesis go hand in hand, and tie into the Arisen series.If you love zombies, and military special forces, then you will love this series. Staff Sgt. Kate Dunajski is military through and through. Eighteen months ago she was in the reserves, hoping to pay for school. Then she was called upon to serve in Afghanistan and finds, after three deployments, that her niche is helping the people of that country. Instead, the military decides she belongs in Somalia, Africa. This is where it starts.Her arrival is met with utter chaos, spilling throughout the town and a certain amount of confusion at Camp Lemonnier, her station. People are firing guns and fighting to get through the gate, onto the base. Helicopters are bringing in wounded soldiers and suddenly the bullets are coming her way. About this time I was able to put myself in her shoes and wonder, "What would I do in this situation?" She does the same thing I would have. She ducks and hides. After that she makes the decision to run for the JOC, or Joint Operations Center. FYI: There are a ton of acronyms in this book, so you might want to jot them down for reference.At first I was completely confused, until I realised, just keep your eyes on the people; that's where the action is. Bullets herald her boisterous entrance into the building, but the numerous people around her, sitting at tactical stations, hardly take notice. Each person has a specific job and each is utterly absorbed by it. Thankfully, she is approached by a soldier who introduces himself as her teammate, Elijah. He takes her under his wing and she is able to observe, without the fear of being shot.From this point on, the story becomes more about the team. All, except for Kate, have been together for a long time and know each others' quirks, vices, and aspirations: the fun they have quoting movie lines that fit any given moment in their daily lives, to knowing that when times are frighteningly serious they can count on each other to have the primary goal of protecting the team.I enjoyed this book quite a bit. There is a lot of action and it's not just about Kate. It's about her blending into the unit and being a soldier just as much as anyone else. It's about these capable men realizing that she is as driven as any other soldier when it comes to the fight. The title alone informs readers that there is a nemesis. However, is it Triple Nickel or is it someone else? That question is part of the excitement of the book. Even though there is an epidemic and, unfortunately, there are zombies running around, that is not the focus of the story. This is a large series with plenty of room for zombies and everybody else. The undead do affect how some things get accomplished or not, but I recommend this book for several other reasons. First, the action is a huge draw, then there are the exhilarating wins and devastating losses, and overall, I wasn't bored for a single minute. The characters were engaging and the ending was a surprise. Although, I did find that the epilogue is just a lead-in to the next book and it was not particularly interesting.My rating:Genre and reading age: Definitely action. I think a teenager interested in military action would enjoy this book and, of course, adults.Level of sexuality: Very little.Was there graphic language? Some, but not too bad.Did I cry? No. It's almost as if the story prepares you for the fact that there are losses in battle. Was I saddened? Absolutely.Is it part of a series? Yes, there are several other Arisen novels, including a prequel.Level of character development: It was very well done.Did I laugh? The subject was serious, but there were a few grin-worthy moments.Overall, I give it ⭐️⭐️⭐️⭐️ stars. Each book tells the continuing saga of a world upside down where everything has changed due to an infection that turns 7 billion people into raving, human hungry zombies. This goes well beyond the Walking Dead for action as Fortress Britain, the only country left standing, is trying to reset the world to being zombie free. The missions are many and the action is hot as American and British military conduct missions across the globe trying to find materials and people in a race to stop the extinction of the human race.There are many characters in this saga and yet the author develops them with depth and reality. The protagonists and the antagonists seem to be so real, as does the action. Reading this saga pulls you in and places you in the middle of the action. This HAS to be one of the BEST Zombie saga's going !!! Detail, information and realism pervades throughout the 12 books (books 13 & 14 will arrive) and I can't wait ! This book is a great continuation of the series! It is a nonstop thrill-ride! Cannot wait until the next installment! This book took me awhile to read. There was a lot more military references and action vs the normal military references and a lot of dead. It didn't make it less enjoyable but it was a much slower read for me. Now this is the redeemer for the entire series. It's actually a good book, well written, great characters you want to root for, and a reasonable story. It fills in the time from the end of Genesis, where Zack and Baxter see ODA-555 blast out of Camp Lemmonier as the zombies take the camp. They all survive, but don't know it until Baxter flying a drone for the jihadis, spots the soldiers camp. After several attacks, where the Americans kill most of their attackers, they rescue Zack and Baxter and discover the existence of Patient Zero. They launch and all out attack to get this zombie (and rescue Kate who got captured in an earlier battle), only to have to retreat with their force dead or wounded right at the moment it looked like they might win. The epilogue has the Carrier appearing in the Gulf. It's far better written than the previous books in the series, mainly because it is a complete stand alone book, not one long book chopped into bits that the other ones are, and that coherence clearly makes it far easier to read. There are no sudden cliffhangers leaving you wondering what happens next. I ALMOST expected all of the good guys to survive, but 3 don't make it, although, it won't surprise me if one shows up in the next book. Jake reminds me of Steven Hunter's character in Avatar, and the Aliens and Top Gun quotes make it funny in part. A fantastic book. Excellent readingI have to say I was riveted by the narrative, taken in by the characters and seduced by the story.This has to be one of the best books I have read in a while. The take on the zombie thing is fresh and, although familiar, it is a new perspective.The action is relentless and very well written.The numerous movie references are great and very appropriate.Finally, there are a few editing mistakes that do not make this book any less enjoyable.In short, a great book, looking forward to reading more from this author. What more can I say about this series! I was expecting the next book in the series but instead we go back to Triple Nickel and right after the outbreak. This was a great book, I loved these guys. I am so wrapped up in this story that I can't even think of what I want to read next while waiting for the next book to Arisen. I don't even know when that is going to be, but you can bet that I will be one of the first to start reading it! And I am hoping it isn't the last book, I just want more and more and more. Great backstory of what is happening in Africa So I missed this because I was searching for Arisen book # over and over again. So don't buy this if you haven't read any Arisen. It won't make sense. But do do get it if you are on book 8+. This is a bit different than the early Arisen books, in that so many people that we love die. Just go with it dude. It all works out and is just slides perfectly into the storyline we all know and love !We find out the origins of camp ______ here! This is a topic that could actually happen, biogically speaking. The action picks up at the very beginning and doesn't stop or even slow down. If you are familiar with this particular series, you will find some of his characters that were present in this first book. The characters are well developed, the probable sequence of events are well documented, and as I stated earlier the action is intense. Have a good read. Absolute very best of the apocalypse genreThis is, without doubt, the best series of this genre. After reading all 12 books back to back, (usually a series becomes a bit boring after the first three books and I will move on to someone else), it was terribly depressing knowing the series had ended. If you enjoy books of the apocalypse, these 12 books will be the absolute best you will ever pick up. An OUTSTANDING series. So in a parallel story arc we get to see where patient zero is awaiting the arrival of our heroes. This arc too does not disappoint with the addition of a team that just does not leave people behind. The interplay in the team dynamics is well brought out. We also meet the root cause of the ZA and the threads are slowly coming together. With another 3 to go wonder if the last 2 will be all about breaking back into Britain. It's Cataclysm time! Best Part So FarHaving reached this far into this thrilling series Arisen Nemesis returned my faith in the plot where Death of Empires had damaged it a bit. Nemesis is an experience by itself. New characters, new perspective and a sh*t load of action. It just wouldn't let up. Stay alert, watch for hints, and enjoy the book, it is so worth it. Loved it.Must admit I have never read a ZA book before. This was a great introduction to the genre, as there was not much ZA in the foreground, it was all in the background.Brilliant story, and could not put it down.More of a military , and survival story then a ZA, but looking forward to reading the next installment. Couldn't put it downThis book was the first I've been able to read from start to finish without getting bored for a long time.It starts wide open and finishes the same way without slowing down one second in between.The author seems well researched and as a veteran and zombie enthusiasts myself it was good to see military and zombie mesh so seamlessly. And the hits just keep on comin...More of the same in a very good way...1) excellent story2) great characters - I mean, unreal. Totally absorbing, heartbreakingly good3) great writing4) fun, fun and more funI really can't say enough about how much I enjoy these books. If the author wrote 100 more I'd read all of them twice over. Happily. Great parallel story!See the fall from POV of SF survivors in Africa. Parallels events in Arisen main story. Was slightly predictable yet that didn't detract from my enjoyment. Burned through the book in just a couple days. Can't wait for the next volume! A great read!!! Truly loved this book. Wasn't sure which character I preferred over another. I definitely knew which character deserved it's outcome. Can't wait to read the next book. Wow. This may be the best one in the series yet. Jake is my hero. Even with his ego, he learned and grew in the end. This may be the best zombie series I've read. Sad that it is probably ending soon. Another Great OneOnce more another great book in a great series. Action packed and thrilling. Thanks guys and keep up the good work! I just couldn't get into this book, read to 87 percent and believe me that was forced reading to that point in the book. Four star series all the way. Love it. Michael Stephen Fuchs - MICHAEL STEPHEN FUCHS is the bestselling author of the acclaimed existential cyberthrillers The Manuscript and Pandora’s Sisters, both published worldwide by Macmillan in hardback, paperback and all e-book formats (and in translation); as well as the D-Boys series of high-concept, high-tech special-operations military adventure novels: D-Boys, Counter-Assault, and Close Quarters Battle (coming in 2014). He is also co-author of the bestselling Arisen series of spec-ops zombie-apocalypse dark action thrillers  as well as solo author of Arisen : Genesis, the bestselling Arisen prequel. He lives in London and blogs at michaelfuchs/razorsedge.